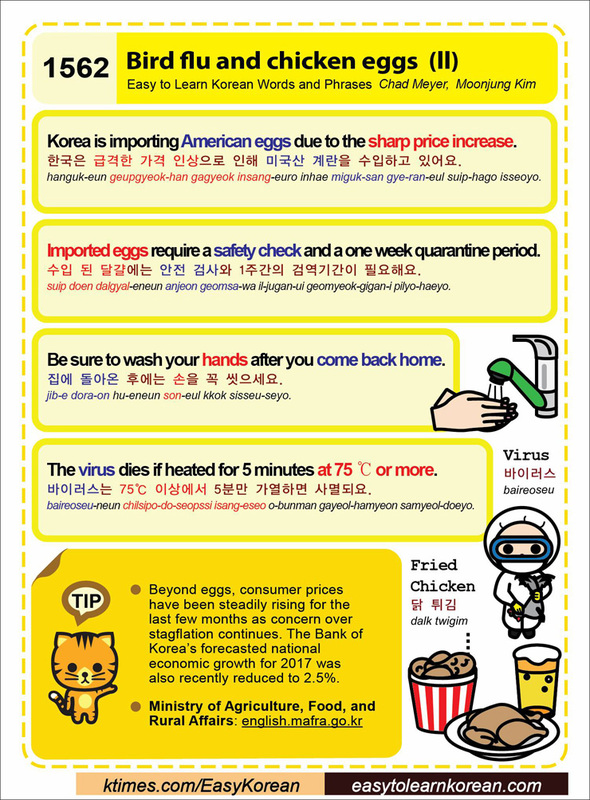 This entry was posted in Series and tagged and Rural Affairs, Bank of Korea, Be sure to wash your hands after you come back home., bird flud, chicken eggs, english.mafra.go.kr, food, Fried Chicken, imported, Imported eggs require a safety check and a one week quarantine period., Korea is importing American eggs due to the sharp price increase., Ministry of Agriculture, national economic growth, The virus dies if heated for 5 minutes at 75 ℃ or more., virus, 바이러스, 바이러스는 75℃ 이상에서 5분만 가열하면 사멸되요., 수입 된 달걀에는 안전 검사와 1주간의 검역기간이 필요해요., 집에 돌아온 후에는 손을 꼭 씻으세요., 한국은 급격한 가격 인상으로 인해 미국산 계란을 수입하고 있어요. by easykorean. Bookmark the permalink.